Calcining is the heating of ores, concentrates, precipitates, or residues to decompose carbonates, hydrates or other compounds. 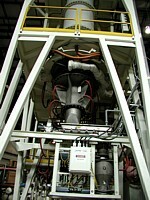 This process is often accomplished within a controlled atmosphere. High temperature applications can be satisfied using induction susceptor thermal technology. We design and manufactures both batch and continuous calcining systems for a variety of applications. The company specializes in high temperature applications involving induction susceptor heating. The sintering process occurs within a vacuum, controlled atmosphere or protective gas cover. In high temperature applications, heat can be applied via induction susceptor technology. The process can be applied to advanced ceramics, cemented carbides, rare earth alloys, tungsten, molybdenum as well as many other materials. Ajax TOCCO designs and manufactures both batch and continuous sintering systems for a variety of applications. The company specializes in high temperature induction susceptor heating applications.